Today is a big day at Backyard Worlds: Planet 9! We’re celebrating our 2nd anniversary, our reboot, and announcing our second paper, published in the Astrophysical Journal letters. (You can read it here for free.) It’s about a unique white dwarf that’s an analog for the solar system three billion years from now; the oldest white dwarf known to host a dusty disk, the likely remains of a planetary system. Check out this guest blog post by our own Melina Thévenot, who explains how she discovered this record-breaking object, which provides such a chilling glimpse into the future. Melina Thévenot, the citizen scientist at Backyard Worlds: Planet 9 who discovered the infrared excess from white dwarf LSPM J0207+3331. Hi everyone. I am Melina Thévenot, a volunteer of the Backyard Worlds: Planet 9 project from Germany. Here I want to tell you a bit about how I discovered an unusual white dwarf and how the researchers uncovered that it is not only unusual, but also cool. How did I discover the white dwarf LSPM J0207+3331? As a volunteer of the Backyard Worlds: planet 9 project, I spent a lot of time searching for brown dwarfs. The Gaia Data release 2 was my favorite survey for the search of brown dwarfs. 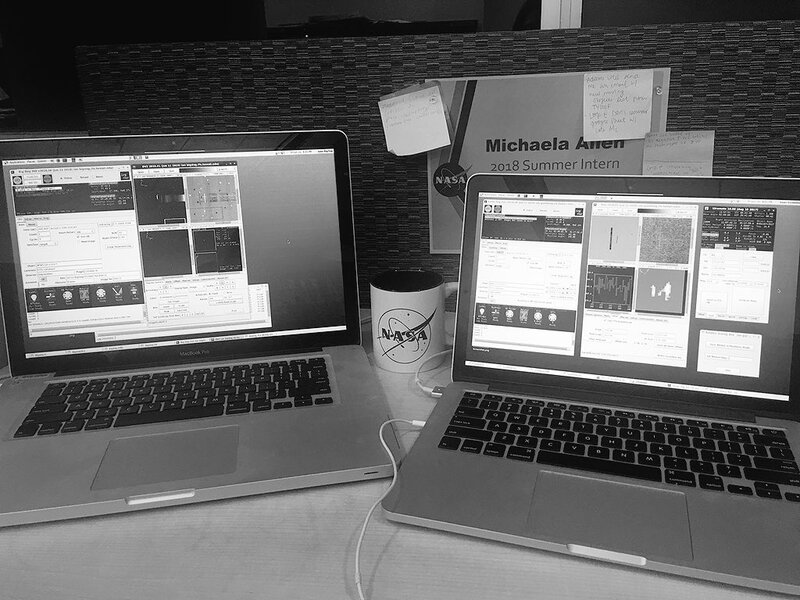 I uncovered probably several hundred new brown dwarf candidates that move in wiseview with the help of three other volunteers: Katharina Doll, Hugo Durantini Luca and Peter Jalowiczor. While improving my search I noticed something about brown dwarfs in the Gaia catalog: some good sources don’t have color information in Gaia DR2. This is a problem, because I relied on a color-cut. To check if I missed any good T-dwarf, I decided to use Allwise to find sources with high infrared excess and the high parallax measurement in Gaia DR2. In the resulting list I could find fake sources that did not move in wiseview, T-dwarfs (distance 5 to 10 parsec) and one source that does not belong in this list. The object in the red circle has a distance of 44 parsec. Gaia should not detect a T-dwarf at this distance. Is it another fake source? I could have ignored it. I am glad I checked the movement. As you can see: Compared to the background objects it is moving and in PanSTARRS you can see a blue source. This source is LSPM J0207+3331. At this time I still had no clue what it could be. I did need some days to think about it. After checking the position in a HR-diagram I knew that it was a white dwarf with large infrared excess (Allwise w1-w2≃1). I guessed that this excess comes from a circumstellar disk. Time to loop in some other volunteers, who are advanced users of Disk Detective. Katharina Doll told me that the source looks good and she confirmed that it was possible for a white dwarf to have a disk, something I did not know until she told me. We decided to contact Marc Kuchner and soon John Debes joined the discussion. John Debes told us this white dwarf is cold, in fact it was 1000 Kelvin cooler than any known white dwarf with an infrared excess. So the researchers decided to observe it with APO. But the dome was closed because of bad weather. Soon the white dwarf was observed with Keck! The telescope with the largest mirror on this planet! What is a white dwarf? Our sun will develop into a red giant billion of years in the future. The red giant will lose the outer layers in a Planetary Nebula. The core that is left is a hot white dwarf and it will gradually cool and become fainter. The process is very violent and “loosing the outer layers” is nothing else than burning the orbiting planets in strong solar winds. But not everything will perish. White dwarfs have a leftover stellar system with asteroids, comets and planets. If an asteroid or comet comes too close to the white dwarf, it can be torn apart by the tidal forces caused by the gravity of the white dwarf and the material settles down in a disk around the white dwarf. In figure 1 of the paper you can see a blue line. This is how the Spectral Energy Distribution (SED) of the white dwarf should look like without a disk. The gray lines are the spectra from Keck NIRES and the black squares are the photometry from different surveys. You can see how the spectra and the photometry are somehow taking off to the right side. This blog post from Disk Detective explains what a SED is and how a SED looks like for star+disk. It might help you interpret this figure. Models that try to describe disks around white dwarfs predict that young white dwarfs are more likely to develop a disk. It is therefore surprising that a 3 Gigayear (3 Billion years old) white dwarf has a disk. Is LSPM J0207+3331 special or are the models about the formation of disks around white dwarfs not accurate enough? Future searches for similar white dwarfs might shine light on this mystery. But this is not where the story of this white dwarf ends. The disk around LSPM J0207+3331 is not a simple disk, but it consists of two components: an outer colder ring with a temperature of 480 Kelvin and an inner ring with a temperature between 550-1400 Kelvin. The white dwarf has an temperature of 6120 Kelvin and a mass of 0.69 solar masses. The outer ring might have formed from a small asteroid that was disrupted by the tidal forces in the recent history of the system. This is the first time such a system was observed. In the future, researchers will observe this white dwarf again and obtain more data, which might tell more about this system. An optical spectrum, for example, might tell us if any material from the disk is falling into the atmosphere of the white dwarf, and what that material is made of. I am very proud to be part of this discovery and hope you enjoyed reading this blog post. Author marckuchner2014Posted on November 16, 2018 November 16, 2018 Categories UncategorizedLeave a comment on The Reboot Is Here! I had the pleasure to give a talk at one of the UK’s leading Astronomical Societies: the MSAS (the Mexborough and Swinton Astronomical Society). The society is situated ~20 km from Sheffield (pop, 570,000) in England and was founded in 1978. Every Thursday evening is a great social occasion centred on a lecture. At least once a month, some academic visits the society to present on an aspect of Astronomy. Academics really enjoy visiting and describe this place as an Aladdin’s cave as may be seen by some of the photos! The first slide of Peter’s presentation. I started with an introduction to the Science team and the important fact that Planet Nine is presumed to exist. It is estimated to be around 10 Earth masses, on an elliptical orbit, averaging a=700 AU because of visible disruption in the orbits of detached Kuiper Belt Objects. Next, the nearest neighbours to the Sun were discussed with examples of these BD systems and the prizes of participating in BYW:P9 included discovering such objects. The flipbook was introduced followed by examples of what to mark and what not to mark: the submissions procedure. How this would be related to the Astronomical software/ procedures described in the second presentation blended both presentations ideally. The successes of BYW:P9 include the discovery of a T Dwarf in the first few days of the project! Members of the Mexborough and Swinton Astronomical Society, enjoying Peter’s presentation, and thinking up tough questions (see below). I started with a comprehensive description of brown dwarfs, with the three main categories and their associated spectral classes; this culminated in a review of the mass-radius relationship from solar-type stars to the terrestrial planets (G. Chabrier et. al., 2008). A chart demonstrated the decrease (compression) of BD radii with mass before the critical mass is reached as a BD turns into a star. After this point the radius increases dramatically. The positions of L, T and Y objects and sub-BD objects was discussed down to Jovian mass. Mass-radius diagram for planet, brown dwarfs and low-mass stars, from Fortney, Baraffe and Militzer 2014. More massive brown dwarfs are slightly smaller than less massive ones. Second, I a gave detailed description of the 2MASS project and the WISE mission, the wavebands in which the detectors operated and the positions of the IR bands on the electromagnetic spectrum. 2MASS: j=1.235um, h=1.662um, k=2.159um. WISE: W1=3.4um, W2=4.6um, W3= 12um, W4=22um. I showed that WISE goes much deeper than 2MASS into the Mid-Infrared. Third, I gave a complete overview of the astronomical tools used: the Backyard Worlds: Planet 9 flipbook, which is at the heart of the project, SIMBAD, VizieR, IRSA Finderchart and BYE Tools (Wiseview). Fourth, I showed a home video of how everything comes together. I showed clips from Backyard Worlds: Planet 9 Hangouts to demonstrate the international calibre of this project, which put on a completely different light on everything. The spectral bands used by 10 different survey telescopes. 2MASS (blue) and WISE (leftmost greeen) are the surveys we use in Backyard Worlds: Planet 9. The principle aims of the project are to discover Brown Dwarfs and Planet Nine. Red Dwarfs are a secondary target and are being catalogued. roughly 5 million classifications of images from NASA’s WISE telescope. Planet Nine has remained elusive, as have Planet X and Tyche (instruments are sensitive to gas giants out to about 50,000 astronomical units from the Sun). Q: What causes the ‘ghosts’/artefacts in the images? Q: The candidates submissions procedure. If it is listed in a Red Dwarf catalog. There seemed to be contradiction in what I said and what seemed to implied by the project. (e.g. I don’t submit a candidate if it is listed in a Red Dwarf catalog in VizieR). Whereas there could be objects listed in Red Dwarf catalogues that are misclassified? Should such objects be submitted or not? It would save time for the user. Q: Brown Dwarfs or Brown Dwarves? One member picked-up on this after I used this (I was using Brown Dwarfs). It turns out that Dwarfs is American English and Dwarves is British English. I was ‘instructed’ to write properly! A: I’m no expert on British English, but perhaps you could consult with the Extrasolar Planets and Brown Dwarfs group at the University of Hertfordshire. Pete at his computer working on Backyard Worlds: Planet 9. Traducido por Daniella Bardalez Gagliuffi and Maritza Gagliuffi. / Translated by Daniella Bardalez Gagliuffi and Maritza Gagliuffi. Aquí está la versión en inglés. / Here is the English version. ¿Qué son esos números a los lados del flipbook? Los números en los bordes de cada imagen son coordenadas celestes. Los números a lo largo del lado inferior (el eje x) son la Ascensión Recta y los números a lo largo del lado izquierdo (el eje y) son la declinación. Estas coordenadas se abrevian “R.A.” y “dec” por sus nombres en inglés. Saber la ascensión recta y la declinación de un objeto, le permite ubicar su posición en el cielo. Estas coordenadas son muy similares a la longitud y latitud que definen la posición de un objeto en la superficie de la Tierra. Sin embargo, note que a pesar que la declinación crece hacia el lado superior de la imagen en esta página web, la ascensión recta crece hacia la IZQUIERDA. La mayoría del tiempo, recitamos R.A. y dec en grados: R.A. varía de 0 a 360 grados, y dec varía de -90 a +90 grados. A veces usted verá el R.A. y dec de una fuente de luz escrita como seis números: R.A. en horas, minutos y segundos, y dec en grados, minutos y segundos. Aquí tenemos una herramienta práctica para convertir de la notación de horas, minutos y segundos a la notación de grados decimales. ¡En este flipbook, hay “dipolos” en todos lados! ¿Qué significa eso? Si usted ve algo que parece como varios “dipolos” en una imagen, quiere decir que ha habido un problema ligero al direccionar el telescopio. Las estrellas no se movieron; el telescopio sí. Me temo que esos son sólo artefactos. Todos los artefactos estelares tienden a moverse — esté atento a aquellos que se mueven diferente al resto. Dipolos verdaderos (objetos que se mueven lentamente) se ven como dipolos en las cuatro imágenes. Se ven como galletas medialuna, especialmente en la primera y última imagen (excepto que el glaceado blanco puede ser azul o rojo). ¿Es esto un “mover”? Parece un mover pero sólo aparece en dos de las imágenes. Idealmente, un mover real debe aparecer en todas las imágenes. Si un objeto sólo aparece en tres, puede ser un problema con ruido aleatorio, por lo tanto, asuma que es un verdadero mover (y deje que el equipo de científicos decida). Si sólo aparece en dos imágenes, es más probable que sea un artefacto fantasma, no un mover. ¿Qué hago si creo que he descubierto algo? Primero, asegúrese de marcarlo en cada imagen con la herramienta de marcado. Luego, haga un comentario en la página TALK usando el hashtag #mover o #dipole con una descripción sobre dónde ubicar el objeto. Esto le informa a otras personas donde buscarlo dentro de la imagen (ej. “#dipole en rosa claro, esquina superior derecha, R.A. 210.98, dec -22.53”). Luego, revise si se ha publicado previamente en la literatura astronómica usando las herramientas descritas abajo. Si usted encuentra un mover o dipole que no está listado en SIMBAD, ¡por favor llene este formulario! Si no llena el formulario, encontraremos su descubrimiento de todas maneras por las marcas hechas con la herramienta de marcado, pero nos tomará más tiempo ubicarlo e investigarlo. ¡Hice 100 clasificaciones! ¿Por qué no he encontrado nada todavía? ¡Gracias por hacer todas esas clasificaciones! En promedio, debería tomar 60 clasificaciones hasta identificar un objeto con movimiento propio alto conocido. Por supuesto, esos son los objetos que ya conocemos, descubrir algo nuevo tomará dedicación de verdad. Si usted ha hecho 100 clasificaciones y no ha encontrado ningún dipolo o mover, puede ser que esté yendo muy rápido. Tómese su tiempo, mire fijamente cada uno de los artefactos para ver si se mueve de forma diferente en comparación con los demás y asegúrese que el brillo de su monitor esté al máximo. Puede ayudarle dividir mentalmente las imágenes en cuatro cuadrantes y mirar fijamente a un cuadrante a la vez mientras corre la animación; recuerde que, si no encuentra nada, sus clasificaciones aún son útiles: nos informan sobre qué tan comunes o raras son las enanas marrones y cómo restringir búsquedas futuras para el Planeta 9. ¿Cómo uso SIMBAD? SIMBAD (el Set de Identificaciones, Medidas y Bibliografía para Datos Astronómicos, por sus siglas en inglés) es una base de datos de objetos astronómicos muy útil usada por astrónomos profesionales y una herramienta crucial para nosotros en Backyard Worlds: Planet 9. Este blog post explica en detalle cómo usarla para revisar si algún objeto que usted ha encontrado ha sido reportado previamente o si es un descubrimiento nuevo. Aquí le ofrecemos una explicación abreviada. Una vez que haya usado los números en los lados de la imagen para estimar el R.A. y dec de su objeto favorito, puede consultar SIMBAD en esa ubicación para ver si resulta en objetos astronómicos conocidos. Por ejemplo, digamos que usted vio un objeto interesante en R.A. 277.68 grados y dec 27.545 grados. Vaya a SIMBAD’s coordinate query page, escriba “277.68 27.545” y presione Enter. Note que estas coordenadas son ecuatoriales (FK4 o ICRS) no galácticas ni eclípticas. Le recomendamos fijar el radio de búsqueda en SIMBAD (o VizieR) a 1 minuto de arco. Además, si usted presiona la tecla “i” en un círculo en el título de una página TALK, verá un link hacia SIMBAD que hará una búsqueda de objetos astronómicos en toda la imagen (la búsqueda se da en un radio de 498 segundos de arco a partir del centro del sub-azulejo que está mirando). Si SIMBAD sólo encuentra una fuente de luz en la imagen que usted está mirando, lo llevará directamente a la página de información sobre dicha fuente. De lo contrario, SIMBAD le mostrará una lista de objetos astronómicos ordenados por su distancia al centro de la sub-azulejo. ¡Haga click en los links para aprender más sobre los objetos que encuentra SIMBAD! SIMBAD utiliza una larga lista de abreviaturas en sus tablas. Por ejemplo, PM* = estrella de alto movimiento propio, BD* = enana marrón, BD? = candidato de enana marrón, WD* = enana blanca. Puede aprender más sobre SIMBAD en esta guía del usuario. Una de las características más útiles de SIMBAD es que cada objeto en el catálogo tiene una lista de artículos científicos que mencionan dicho objeto. Si baja a 3/4 de la página, encontrará las “References”. Puede hacer click en “sort references” para ver los títulos de artículos científicos que hayan mencionado o discutido su objeto favorito, si es que hay alguno. Asegúrese de navegar a través de éstos; su objeto favorito puede que sea el foco de un tremendo debate internacional o que haya jugado un rol como calibrador o referencia astrométrica. ¿Cómo uso el Finder Chart? Una tercera revisión que podría hacer sería revisar el NASA IRSA Finder Chart para un campo. Usted encontrará un link en la Finder Chart que mostrará más imágenes de las que mostramos en la herramienta de parpadeo. A diferencia de las imágenes en nuestra página web, las imágenes en el Finder Chart no han sido procesadas para resaltar fuentes de luz que evolucionan con el tiempo. Por esto, usted puede encontrar que un campo que pensó que estaba casi vacío en realidad está bastante lleno. Finder Chart le mostrará imágenes en varias bandas diferentes: óptica, infrarroja e infrarroja media. Cada una ha sido tomada en un momento diferente. Si su objeto favorito es extremadamente frío (como una enana Y o un planeta), puede ser que no lo vea en ninguna otra imagen aparte de las de WISE. Si el objeto es caliente (como una estrella), puede ser que lo vea en varias décadas, desde imágenes ópticas a infrarrojo medio. Cuando abre Finder Chart, verifique que está viendo el mismo campo que está examinando en nuestra página web fijándose que las mismas estrellas estén en el mismo lugar. Luego, cuidadosamente vea si puede identificar al objeto en otros catálogos (DSS, SDSS, 2MASS, WISE). Haga una anotación en TALK acerca de los catálogos en los que puede ver el objeto. Además, si su objeto es un mover, y si lo puede ver en imágenes de varios catálogos (como 2MASS y WISE), fíjese si puede ver al objeto moverse de una imagen de un catálogo a la siguiente. Luego de este paso, haga una anotación de las fechas de cada imagen y cuantos píxeles (o mejor aún, segundos de arco) se ha movido. La distancia que se ha movido, dividida por la diferencia en tiempo (en segundos de arco por año) nos dice la velocidad tangencial del objeto, un número crucial. ¿Qué son los azulejos y sub-azulejos? El catálogo unWISE divide el cielo en 18,240 “azulejos”. Nosotros hemos dividido cada uno de ellos en 64 “sub-azulejos”, que se convirtieron en las imágenes que usted ve aquí. Sí, son muchos sub-azulejos. El número de sub-azulejo es el número “ID” que aparece cuando le hace click a la “i” en un círculo bajo cada imagen. ¿Cómo uso VizieR? Si usted no puede encontrar lo que busca en SIMBAD, puede usar VizieR para consultar una lista más larga de catálogos astronómicos — ¡casi todos los catálogos que se han publicado! Puede encontrar una introducción a VizieR mucho más detallada en este blog post, aquí le presentamos unas recomendaciones básicas. Primero, escriba el R.A. y dec de su objeto favorito donde dice “Search by Position” (búsqueda por posición), seleccione una “Target dimension” (“dimensión de objetivo”) de 1 minuto de arco y haga click donde dice “Go”. Alternativamente, cuando haga click en la “i” en un círculo del título de una página TALK, usted encontrará un link a una búsqueda de VizieR de un radio de 498 segundos de arco desde el centro de la imagen. A diferencia de SIMBAD, VizieR le devuelve MUCHÍSIMAS listas de fuentes, una por cada uno de los catálogos que busca. Cada lista se organiza en orden de distancia de las coordenadas que usted ingresó (ya sean las coordenadas que estimó o el centro del sub-azulejo). Cada catálogo que busca tiene un propósito y condiciones especiales, así que usted deberá leer un poco para utilizar esta poderosa herramienta al máximo. Pruebe en combinar los resultados de una búsqueda para referencias a “proper motion” (movimiento propio), ya que es muy posible que haya identificado una fuente de luz que se ha movido (mover). Ej. Usted puede buscar las letras “pm” en la página web y restringir la búsqueda a objetos con movimiento propio mayor que 100 mas/yr, frecuentemente verá “pmRA” para movimiento propio en ascensión recta y “pmDE” para movimiento propio en declinación. Si encuentra algo que no está en VizieR, por favor anótelo en TALK con el hashtag #notinvizier. Nota: si usted encuentra su objeto en VizieR pero no en SIMBAD, por favor envíelo al formulario Think You’ve Got One. Nota: no confíe en los movimientos propios listados en el catálogo AllWISE en VizieR. Son sistemáticamente muy altos. Estamos buscando una razón para ello. ¿Por qué algunas imágenes en este flipbook son negras o parcialmente negras? Hubieron algunos problemas en la misión WISE que imposibilitaron la toma de datos temporalmente y el resultado fue pedazos de cielo donde no hay datos durante algunas épocas, por ejemplo, durante Abril 3, 2004 y Abril 9, 2004, la computadora de la astronave dejó de funcionar correctamente, y la misión tuvo que ponerse en “modo seguro” mientras el comando en Tierra la reiniciaba. ¿Cuáles objetos con movimiento propio se han descubierto previamente? Esta hoja de cálculo lista 3036 objetos conocidos con movimiento propio mayor a 600 milésimas de segundo de arco. Probablemente se encuentre con algunos de estos objetos mientras busca nuevos. Sin embargo, esta lista no cubre todos los posibles dipolos o movers conocidos; usted será capaz de ver dipolos con movimiento propio menor a 200 milésimas de segundos de arco por año, en todo caso, asegúrese de revisar SIMBAD directamente si cree que ha descubierto algo nuevo antes de reportarlo usando el formulario. ¿Qué es esa raya gigante dibujada a lo largo de la imagen? Probablemente es una espiga de difracción asociada con la imagen de una estrella brillante, justo fuera del borde del sub-azulejo al que está mirando. Las espigas de difracción son causadas por luz que se difracta de la estructura de soporte del espejo secundario del telescopio. Las espigas de difracción son la razón por la cual la gente dibuja estrellas con puntas saliendo de ellas. En realidad, las estrellas son más o menos redondas; las puntas o espigas son creadas por telescopios y a veces por nuestros ojos. ¿Qué tan grandes son las imágenes que estoy mirando? Cada imagen tiene 256×256 píxeles y cada píxel mide 2.75 segundos de arco de largo, entonces, las imágenes tienen 704×704 segundos de arco, que equivalen a 11.73×11.73 minutos de arco o 0.195×0.195 grados. ¿Qué hago si veo un mover que se sale del borde de la imagen? Primero, lea el blog post sobre movers rápidos. Luego, si usted decide que este objeto todavía es interesante (ej. Si no es un rayo cósmico u otro tipo de ruido), hay unas cuantas cosas que puede hacer. Primero, márquelo en TALK con los hashtags #mover y #outofframe para que otros puedan hacerle seguimiento, luego, si hace click en el ícono de información en el título de una página de TALK (el i en un círculo en la parte inferior derecha del flipbook), verá “id numbers of nearest subtiles”. Esos números le permitirán buscar los sub-azulejos adyacentes que gustaría revisar. Para buscarlos, hay dos archivos grandes que va a necesitar. Vaya a https://github.com/marckuchner/byp9 y descargue byp9.subjectnumbers0-583679.csv y byp9.subjectnumbers583680-1167359.csv. La primera columna de cada archivo tiene una lista de los números de sub-azulejos, esos son los números de “Subject ID” de la metadata. La segunda columna tiene una lista de los números de “subject”, esos son números de subject de las páginas web de TALK. Tuvimos que dividir esta tabla de búsqueda en dos archivos, uno para sub-azulejos de números 0-583679, y la otra para números de sub-azulejos 583680-1167359, de otra forma los archivos serían demasiado grandes para descargar. Usted puede buscar cada uno de estos 10 “id numbers of nearest subtiles” en el archivo .csv correspondiente y éste le dirá el número de subject de las páginas web TALK. Coloque uno de estos números al final de la URL de TALK para ir a la página TALK de ser flipbook y así buscar su mover. ¡Disculpe que esto es tan complicado! Estamos tratando de simplificar este proceso. ¿Por qué el R.A y dec de esta imagen están fallados? Los datos de unWISe se guardan usando una proyección gnomónica, que funciona muy bien a través de la mayoría del cielo. Cerca de los polos celestes sur y norte, ¡líneas de R.A. y dec constante ya no corresponden a las líneas rectas de nuestras imágenes! Entonces, a pesar de que las etiquetas de los ejes son técnicamente correctas cerca a los polos, ya no son tan útiles; esto sólo es un problema dentro de un radio de 1 grado alrededor del polo (i.e. para menos de 0.2% de las imágenes). Si usted es suficientemente suertudo para encontrar un objeto interesante en una de estas regiones cerca a un polo, deberá utilizar el Finder Chart para estimar precisamente el R.A. y dec del objeto. Haga click en la i dentro del círculo en una página talk y haga click en el link a la Finder Chart. Luego, mueva el cursor sobre la ubicación correspondiente a su objeto. Las coordenadas aparecerán en la parte superior de su pantalla de Finder Chart. Probablemente encuentre útil hacer click en el botón que dice “Lock By Click” de tal forma que al hacer click en el objeto de una imagen, las coordenadas de ese objeto se muestran incluso cuando usted continúe moviendo el cursor. ¿Cuántos flipbooks hay para clasificar? Tenemos más de un millón de subjects (objetos no clasificados) para clasificar, la mayoría de estos no están online todavía, así que no confíe en el número de “completeness” en la página de destino; ese número solo se refiere al lote de subjects que ya está en línea. ¿Cuándo empezaremos a escuchar resultados sobre el proyecto? Después de hacerle click a un dipolo o mover, o mencionarlo en TALK o enviarlo a través del formulario “Think You’ve Got One”, el siguiente paso para nosotros es investigar ese objeto y averiguar lo que ya se sabe de él. Luego tenemos que aplicar a tiempo de telescopio para hacerle seguimiento a los objetos más interesantes para tomarles un espectro. Los espectros de luz nos ayuda a averiguar sus tipos espectrales y sus temperaturas, e identificar si lo que estamos viendo es realmente una enana marrón o un planeta. Todo ese proceso generalmente toma meses. Para tener las últimas actualizaciones, ¡síganos en Facebook o en Twitter @backyardworlds! ¿Cuál se supone que es la apariencia de Planet 9? La Field Guide contiene simulaciones de cómo se podría ver Planet 9, y aquí hay un blog post crucial con detalles sobre los patrones característicos del planeta que siguen un movimiento JUMP JUMPBACK, y JUMP hop JUMP hop. Su color depende de cuánto metano contiene su atmósfera. De acuerdo a los modelos de Fortney et al. 2016, Isi el planeta tiene una composición similar a la del Sol, con gas metano en su atmósfera, será más brillante en la banda WISE 2, así que se verá rojo en los flipbooks. Si el metano se ha congelado en su atmósfera, que parece probable, el planeta se verá más brillante en la banda WISE 1 y se verá azul en los flipbooks. También es posible que el planeta sea muy pequeño y oscuro como para verse en nuestros datos. En todo caso, debería ser un mover y debería moverse rápido, probablemente la mitad o todo el camino a través del flipbook, mientras usted observa. Note que su movimiento de saltos en el flipbook será más o menos horizontal. ¿Qué son variables Mira? Muchos de los objetos más brillantes que verá en Backyard Worlds: Planet 9 son gigantes rojas, que a veces pulsan. Para hacer las imágenes que usted ve en esta website, restamos una época de la otra, lo que causa que las estrellas variables destaquen. Si usted ve un artefacto estallar enorme como el presentado arriba, es probable que sea una gigante roja pulsante. Las variables Mira son un tipo de gigante roja pulsante. Estas estrellas gigantes y frías se convierten cien veces más brillantes y luego débiles otra vez durante un período de un año aproximadamente. ¿Cómo se ven las enanas marrones? Se conoce que las enanas marrones son más brillantes en las bandas WISE 2 (4.6 micrones) que en la banda WISE 1. Entonces se ven rojas o blancas en nuestra escala de color. Pueden ser movers o dipolos. ¿Quién más está buscando al Planet 9? Varios otros grupos están buscando a Planet 9. 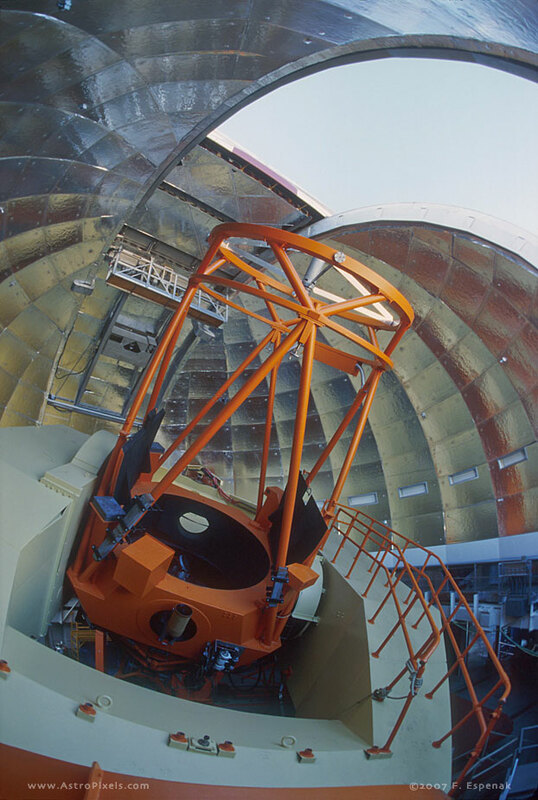 La Dark Energy Survey utiliza un telescopio en el Observatorio Interamericano del Cerro Tololo. La survey Pan-STARRS utiliza un telescopio dedicado en Mt. Haleakala en Hawaii. El telescopio Subaru en Hawaii también está haciendo una búsqueda más profunda pero altamente colimada. La survey SkyMapper utiliza un telescopio en el Observatorio de Siding Spring en Australia; esta survey es la base para otro proyecto de Zooniverse llamado simplemente “Planet 9”. Todas estas otras surveys están buscando en longitudes de onda ópticas utilizando telescopios basados en Tierra, mientras que nosotros en Backyard Worlds: Planet 9 estamos buscando en longitudes de onda infrarrojas utilizando un telescopio en el espacio. Esto nos permite buscar en todo el cielo, en vez de estar limitados a un pedazo de cielo. Nadie sabe todavía si Planet 9 será más brillante en las ondas infrarrojas en las que estamos trabajando o en ondas ópticas donde trabajan las otras surveys, entonces tiene sentido buscar en ambas partes del espectro. Lea el blog post de Aaron Meisner para aprender más. ¿Podrían haber planetas más allá del Planet 9? Es posible que hayan más planetas aún no descubiertos en órbita alrededor del Sol, además de Planet 9. Volk and Molhotra (2017) sugirieron recientemente que un décimo planeta podría ser responsable por causar una deformación del plano del cinturón de Kuiper. Este pequeño planeta probablemente sea muy débil para detectarlo aquí en Backyard Worlds: Planet 9. Del mismo modo, otros planetas podrían estar al acecho más allá de las presuntas órbitas del noveno o décimo planeta. Sin embargo, no hay evidencia en particular que favorezca a un onceavo planeta, como sí la hay para un noveno planeta. ¿Por qué nos importan las enanas marrones? Las enanas marrones son el vínculo entre la formación de estrellas y la de planetas. Tienen características físicas comunes entre estrellas y planetas. Contando el número de objetos que hay y determinando sus masas, podemos aprender sobre cómo se forman los planetas, estrellas y galaxias. Las enanas marrones frías son particularmente útiles porque las usamos como análogos a exoplanetas. Son del mismo tamaño que Júpiter y a veces la misma temperatura que Júpiter o incluso, la Tierra, pero son mucho más fáciles de estudiar que los exoplanetas porque éstas no orbitan estrellas brillantes que las opacarían con su brillo. Como consecuencia, podemos obtener información muy detallada sobre sus atmósferas, lo cual nos informa acerca de su composición, rotación, nubes, tormentas e incluso propiedades magnéticas. Algunas enanas marrones incluso tienen planetas que las orbitan. Trabajando con usted en este proyecto de ciencia ciudadana, esperamos descubrir enanas marrones exóticas con características de nubes que nos ayuden a entender la diversidad de atmósferas encontradas en exoplanetas. Para aprender más, lea el blog post de Jackie Faherty. ¿Cuántas enanas marrones esperamos encontrar? Tenemos una idea razonable sobre cuántas estrellas y enanas marrones hay cerca al Sol con tipos espectrales L2 y más tempranos (más calientes), pero la mayoría de éstas probablemente ya se han encontrado. Los tipos tardíos (más fríos) se mantienen misteriosos. ¡Uno de nuestros goles principales en Backyard Worlds: Planet 9 es resolver esta pregunta sobre qué tan comunes son las enanas marrones más frías! En 2012, Kirkpatrick et al. estimó que hay 5 enanas marrones con tipos T6-T8.5 y por lo menos 6 de tipos T9 y más tardíos (más frío) a menos de una distancia de 7 parsecs a partir del Sol. Luego Luhman (2014) descubrió un nuevo objeto llamado WISE J085510.83-071442.5 que rompió el récord de la enana marrón más fría, y eso forzó a la gente a rehacer sus estimaciones. Desde ese entonces, Zapatero Osorio et al. 2016 estima que debe haber entre 15 y 60 enanas marrones de tipo Y2 dentro del volumen de 7 parsecs alrededor del Sol. Mientras tanto, Yates et al. 2016 predijo que dentro de 10 parsecs alrededor del Sol, hay 3 enanas tipo Y con tipos entre Y0 e Y0.5, y solo uno con un tipo más tardío (más frío, como Y1 o Y2). Cómo puede ver, el amplio rango de estimaciones surge porque se hacen extrapolaciones de una lista conteniendo solamente unos cuantos objetos. ¿Cuántas enanas marrones se conocen hoy en día? Miles. dwarfarchives.org actualmente enumera 1281 enanas marrones de tipo L y T (hasta 2012). Sin embargo, sólo 24 enanas marrones son de tipo Y (a temperatura ambiente) y sólo 3 se encuentran a 10 años luz o menos del Sol. Esperamos encontrar más de estos objetos raros y cercanos. ¿Qué son enanas de tipos M, L, T e Y? Al igual que las estrellas, las enanas marrones se clasifican por las líneas de absorción en sus espectros, que son indicadores de su temperatura superficial. Las enanas M tienen una temperatura de 3500-2100 K, las enanas L de 2100-1300 K, las T de 1300-600K y se cree que las enanas Y son más frías que 600K. Como casi todas las enanas marrones tienen el mismo tamaño físico, a menor temperatura, menor brillo emite el objeto. Los “tipos” de enanas marrones son una continuación de la secuencia de tipos estelares; la lista completa es O, B, A, F, G, K, M, L, T, Y. Cada tipo tiene subtipos, indicados por números, que describen variaciones más sutiles en temperatura, por ejemplo, una enana T6 es más fría que una enana T3. Tanto las estrellas como enanas marrones pueden ser enanas M; las enanas marrones no son generalmente más calientes que una M6. Acá hay una reseña científica de Adam Burgasser con más información. ¿Cuál es la enana marrón más cercana? Un par de enanas marrones llamadas Luhman 16 o WISE J1049-5319, que se ubica a 6.52 años luz (1.99 parsecs) del Sol; son las enanas marrones conocidas más cercanas. Probablemente usted descubrirá una que está aún más cerca. Este diagrama (crédito: NASA/Penn State University) muestra las ubicaciones de las enanas marrones y estrellas más cercanas al Sol. ¿Podemos ver planetas en el Cinturón de Kuiper u otros objetos del Cinturón de Kuiper en estas imágenes? No, son muy débiles en estas longitudes de onda. ¿Qué significa MJD? MJD son las siglas en inglés para Modified Julian Date (Fecha Juliana Modificada), el número de días desde la medianoche del 17 de Noviembre de 1858. Cada imagen astronómica en esta página web tiene una estampilla de tiempo con una Fecha Juliana Modificada indicando cuándo se tomó.